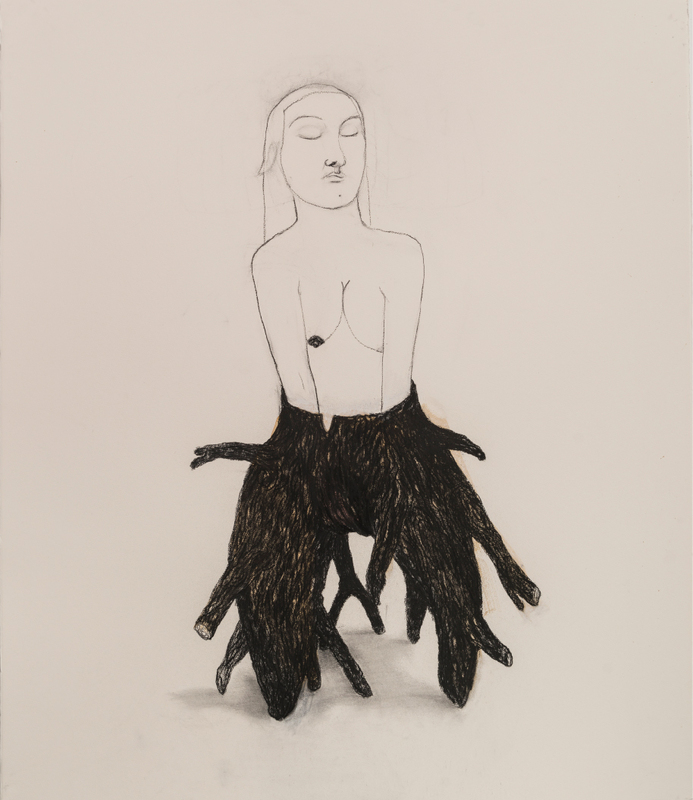 Alice Maher’s exhibition The Glorious Maids of the Charnel House at the Kevin Kavanagh Gallery walks a fine line between the beautiful and the grotesque. These nine large-scale drawings are a return to familiar themes of metamorphosis and mutability for Maher. They have a hypnotic quality, an intriguing otherworldliness and a visceral strangeness that makes it difficult to look away. This is strikingly evident in The Diviner, in which a serene female figure reminiscent of a midwife is shown with her hand plunging into the entrails of an ambiguous human/animal figure. The detailed evocation of this lion-like being, depicted with feminine lips, flowing curls and an expression of ecstasy, draws on themes of hybridity, while the complete scene reveals a fascination with bodily intermingling. The exhibition interrogates canonical visual representations of the feminine, reworking them to emphasise the agency and creativity of women. The Great Virgin, for example, draws on representations of the Virgin Mary. Here, however, she is depicted with streams of reddish-pink tears pooling into fleshy, lung-like objects. The visceral pain of the image is at once horrifying and mesmerising. The Great Virgin is imbued with power and life. In every drawing, Maher’s magic-realist approach depicts the female body in a sensitive and imaginative way, as a site of possibility and regeneration, transformed in the murky setting of the charnel house. 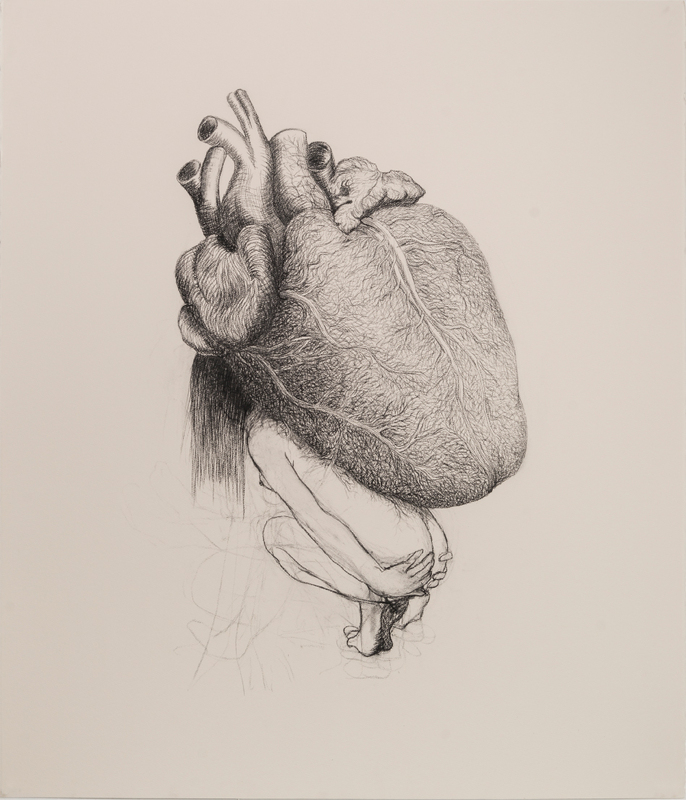 Some of the drawings, like The Hunter, where the figure is burdened by the weight of a huge, graphic heart, have the forensic precision of medical textbooks. Others are more overtly abstract and fantastical, such as Visitant, in which the dark, shadowy figure is covered with staring, pink eyes. The idea of spectacle is central to the depictions of the Glorious Maids. Kinsella quotes Mary Russo: “She [the other woman] is making a spectacle out of herself.” Maher’s ‘maids’ consciously make a spectacle of themselves, delighting in Maher’s carnivalesque imagination. They cannot be contained by notions of respectability or feminine modesty. Their bodies, represented with strange appendages or dramatic mutations, subvert expectations. The exhibition runs until 2 July. For a glimpse into the highly inventive mind of one of Ireland’s foremost contemporary artists, it’s not one to miss. The Glorious Maids of the Charnel House offers a unique and thought-provoking perspective on the female form.